Carcass Era " Reek Of Putrefaction " serta " Symphonies of Sickness " rupanya masih menjadi salah satu Spirit tersendiri dalam perkembangan Genre Death Metal dengan sentuhan Goregrind Element pada awal perkembangannya sehingga menumbuhkan genre selanjutnya yang kemudian dipopulerkan oleh Haemorrhage, The County Medical Examiners, General Surgery, etc dengan karakter sounding yang lebih modern namun ga terlepas dari konsep utama 2 album fenomenal Carcass bagi perkembangan Genre Goregrind. paired in a sonic attack with the highest throaty gurgles you'll ever hear, both delivering the most complicated and medically accurate information about forensics and autopsies. This is true goregrind, none of that sloppy intestines, maggots and faeces muck, they spent time on these lyrics. Time and effort. nah Saat ini Gw menemukan Perkembangan Old School Genre ini setelah mendengarkan Materi Full Album band asal Johor, Malasya yang eksis sejak tahun 1995, Sickness, kendati nama Sickness sendiri terhitung sudah banyak band yang menggunakannya, tapi Sickness Asal Negeri Tetangga Malasya ini memainkan Konsep Yang Lebih Membawa kita Nostalgia era kejayaan The Mighty Goregrind Carcass era " Reek Of Putrefaction " serta " Symphonies of Sickness " dalam full album pertama " Necrosymphonies Of Necropsy " yang dirilis oleh Grundar Production, Label Metal independen sekampung dengan Sickness. 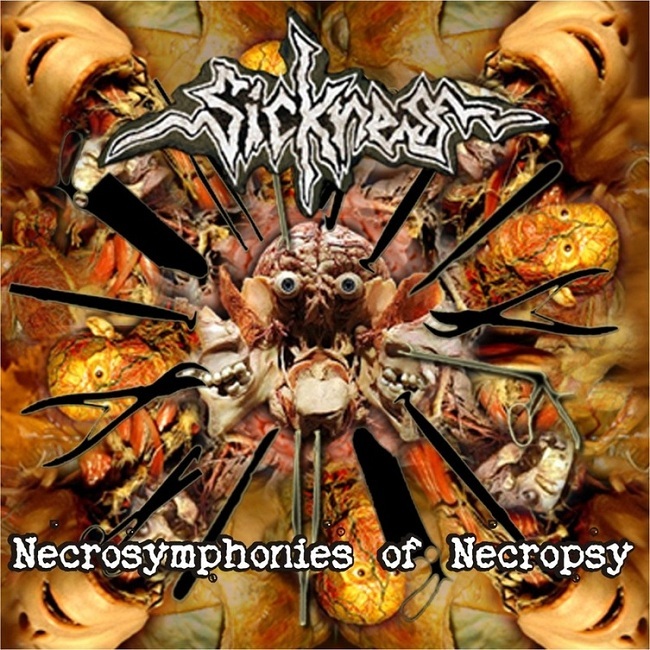 Surprise juga saat pertama kali gw mendapatkan CD ini dan kemudian mendengarkannya, Musically, think a re-arranged version of "Reek" + "Symphonies of Sickness", with a new sound based off the old sound. The guitar is more distorted and the bass is cleaner, and the burping vocals placed sickeningly in the foreground. Expect grind, groove and guts - oh, so much guts. I haven't seen artwork as artistically repulsive like this since I opened Reek for the first time. Collages galore. " Post Autopsy Decomposition " yang dimulai dengan sebuah Intro yang Sedikit " Horror " selama 01:15 barulah kita disuguhkan dengan karakteristik Carcass Abis !! yeah Carcass is Back Reincarnation on Sickness !! sebuah Opening track yang cukup untuk memanaskan Moshpit Gigz area pada setiap performance untuk Audience terhipnotis Headbang !! Downtuned Sound Riff yang simple cukup memang kita merasakan Imej Kuat Gaya Bermain Carcass di 2 album Bersejarah itu. Raungan Guttural Gurgling Gitaris dan Vokalis Jake bagi Gw kurang membawa Kekuatan tersendiri walao kerap dibantu dengan Vocal Harmonizer sekalipun, mungkin Jake juga masih terlalu memperhitungkan dan terlalu Konsentrasi dengan instrumen Guitarnya, tapi salut untuk usaha kerasnya sebagai Mastermind Musik dan Lirical Band ini. Komposisi Musik yang lebih menawarkan atmosfir Riffing yang gelap adalah pencampuran karakter Old Morbid Angel, sementara Drummer Ah Fad Gw rasa kurang memberi sentuhan yang powerfully dengan ketukannya apalagi Twin Pedal yang Jarang digunakan pada Hypersnare-nya, sehingga Gw merasakan Typical yang simple Art saja. Fascinating Thrash Riffing memang menjadi kekuatan tersendiri pada Imej Sickness agar tidak terlalu menjadi Kloning tajam Nama Besar Carcass ! ... Komposisi Keren dan Kuat yang kerap dimulai dengan sebuah Intro " Warning " ini " Pungent Reek of Incinerated Carnage, Urogenital Evisceration, Disgorgement of Innards serta Endoparasitical Maggot Infestation " cukup untuk menggambarkan karakteristik Band yang Simple en Catchy dalam mengkomposisi Sebuah Track. beberapa sentuhan Synthesizer yang cukup Bikin Nuansa Horror dan Gelap kerap beberapa kali menyelimuti. Of course, the undeniable tribute factor plays a major part in the album, calling in on Reek's nostalgia value for replayability. Ignoring the blatant song rip-offs (which is acceptable, since they are an open tribute band) and the demo-like production, this album is a worthy predecessor of the significantly superiour Olidous Operettas. If you're a new listener, try this one out first, the second will sound even better in comparison. If you hear that one first, there's a high chance this one will seem unbearably primitive. Materi Recording Album ini ditangani oleh Bob "Morgue Keeper" Agigi, yang kita kenal sebagai Mantan Member band Demisor dan kini Juga eksis di 2 band terkenal Scene Malasya, Castigate dan Damokis, sementara Drummer Ah Fad kebagian Tugas lain untuk mendesain Artwork Kover yang masih ga jauh dari Tema2 Medical Gore konsep, semakin merasakan kuat sekali Imej Kuat Carcass ! Sickness serve up some good grind on their first album, but if you're looking for something groundbreaking, go look elsewhere. You won’t find anything that’s new, and that’s what Sickness want. This is pure Carcass-worship, and they do not claim to be otherwise. The production is much better than both those releases, although it doesn’t make them a better band. The problem is, the songs aren’t memorable at all. On subsequent listens, the album lost some of its fun minimalist charm. The Examiners probably didn’t have longevity in mind while recording this. Era Carcass "Reek Of putrefaction" and "Symphonies of Sickness" apparently is still one of their own in the development of Spirit Genre Death Metal with a touch of goregrind Element in early development, so grow the next genre later popularized by Haemorrhage, The County Medical Examiners, General Surgery, etc with a more modern sounding character but ga apart from 2 main concepts for the development of phenomenal album Carcass goregrind genre. paired in a sonic attack with the highest throaty gurgles you'll ever hear, both delivering the most complicated and medically accurate information about forensics and autopsies. This is true goregrind, none of that sloppy intestines, maggots and faeces muck, they spent time on these lyrics. Time and effort. nah Currently I Development Old School Genre find this after listening material Full Album band from Johor, Malasya which exists since 1995, Sickness, Sickness own name although many bands are starting to use it, but the State of Origin Sickness Neighbors Malasya plays Concepts More Nostalgia brought us a golden era of The Mighty goregrind era Carcass "Reek Of putrefaction" and "Symphonies of Sickness" in the first full length album "Of Necrosymphonies Necropsy" which was released by Grundar Productions, an independent label Metal compatriot with Sickness. Surprise was also the first time I get this CD and listen to it later, Musically, think a re-arranged version of "Reek" + "Symphonies of Sickness", with a new sound based off the old sound. The guitar is more distorted and the bass is cleaner, and the burping vocals sickeningly placed in the foreground. Expect grind, groove and guts - oh, so much guts. I have not seen artwork as artistically repulsive like this since I opened Reek for the first time. Collages galore. "Post Autopsy Decomposition" which starts with a little intro "Horror" for 1:15 then we are presented with Carcass characteristics Abis!! yeah Carcass on Sickness Reincarnation is Back! Opening a track which is enough to heat Gigz moshpit area at each performance for the audience hypnotized Headbang!! Sound downtuned riff is simple enough we feel The image Strong Play Style 2 Carcass in the Historic album. Guttural roar gurgling guitarist and vocalist Jake for Gw less carry its own power walao often assisted with Vocal Harmonizer though, maybe Jake is still too much account and concentration with Guitarnya instrument, but as a salute to her hard work and Lirical Band Music Mastermind's. Music Composition offering an atmosphere that is more dark riffing is mixing Old Morbid Angel character, while drummer Ah Fad Gw gives less sense powerfully touch with his knock which moreover Twin Pedal Rarely used in his Hypersnare, so Gw feel Typical Art only that simple. Fascinating indeed Thrash riffing into force Sickness The image separately in order not to be a sharp Cloning Carcass Great Name! ... Cool and Strong composition which often starts with an Intro "Warning" is "Pungent Reek of incinerated Carnage, Urogenital Evisceration, disgorgement of Innards and Endoparasitical Maggot Infestation" is enough to describe the characteristics of a Simple Band en Catchy in composing a Track. some pretty touches Synthesizer Makes Horror and Dark shades often several times envelop. Of course, the undeniable tribute factor plays a major part in the album, calling in on Reek's nostalgic value for replayability. Ignoring the blatant song rip-offs (which is acceptable, since they are an open tribute band) and the demo-like production, this album is a worthy predecessor of the superiour Significantly Olidous Operettas. If you're a new listener, try this one out first, the second will sound even better in comparison. If you hear that first one, there's a high chance this one will seem unbearably primitive. Recording this album material handled by Bob "Morgue Keeper" Agigi, which we know as the former Member Demisor band and now also exist in 2 Scene Malasya famous band, Castigate and Damokis, while Drummer Ah Fad gets another task to design a Coverage Artwork is still not away from Gore Medical themes concept, the very strong feeling Strong Carcass The image! Sickness serve up some good grind on their first album, but if you're looking for something groundbreaking, go look elsewhere. You will not find anything that's new, and that's what Sickness want. This is pure Carcass-worship, and they do not claim to be otherwise. The production is much better than both those releases, although it does not make them a better band. The problem is, the songs are not memorable at all. On subsequent listens, the album lost some of its fun minimalist charm. The Examiners probably did not have longevity in mind while recording this.